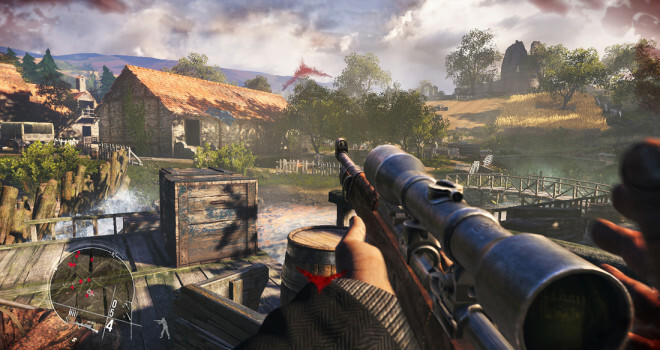 Enemy Front Marks The Return Of The WW2 Shooter- Published By Namco Bandai. Today’s surprise news is that Namco Bandai Games of America has formed an exclusive publishing agreement with developer CI Games, by which Namco will publish the studio’s upcoming console releases of Enemy Front and Lords of the Fallen in America. For those that don’t know, Lords of the Fallen is an Action RPG that promises “Over 15 boss encounters including giant beasts” “Large variety of tactical medieval based weapon fighting techniques” “Powerful and spectacular supernatural skills” when translated into real English means: We’re ripping off Dark Souls. The trailer isn’t anything to go on. No Gameplay, whatsoever. This game will be released for the Xbox One, PS4 and PC. While, Enemy Front isn’t exactly treading new ground seeing as though it’s another military first person shooter touting pretty realistic graphics….yippee. The only thing that kind of sets it apart from the slew of shooters is that it takes place in World War 2…..again releasing for the PC, Xbox 360 and PlayStation 3 in the spring of this year. The game features close quarters combat; class-driven, cover-based enemy behavior; vehicular bosses; destructible environments; multiple mission types such as sabotage, espionage, assassination and assault; gameplay customization; authentic weaponry as well as exaggerated, over-the-top weapon effects; and “faithfully recreated theatres of conflict” including France, Norway, Greece and Poland.